Ronald was clearly angry after the Spurs game and may have considered changing the team – but knocks to Pellè and Cédric forced his hand with Long and Martina coming in (the latter for his first Premier League start). Tadić was dropped for Ward Prowse and Stekelenburg took back the keeper’s jersey after his injury. Arsenal were missing a number of first choice players but their XI had gained decent results in the past weeks and everyone expected they would beat Saints to go top of the league. In the early minutes Arsenal created a couple of decent chances which Giroud was unable to finish. Up the other end Long was flagged offside twice. He also was bundled over twice by Koscielny, Mr Moss seeing neither as a foul. Interestingly, on returning to the pitch after treatment, he sidled up to the Arsenal defender for a “word in this ear”. From that point onwards he ran the Arsenal defence ragged. On 13 minutes Saints first real chance was created by Davis who fed Mané. The shot was blocked by defenders. Arsenal won another corner which Giroud headed wide. Arsenal recovered the ball and sent Monreal in on goal. Stekelenburg saved comfortably. Saints were moving the ball nicely and went ahead in the 19th minute. Steven Davis nodded the ball wide to Bertie whose cross was headed out by the stooping Mertesacker. The ball ran to Martina who struck the sweetest of curling shots with the outside of his right boot. It started way wide of the far post but curled back, beyond the despairing dive of Cech , and nestled in the corner of the net. 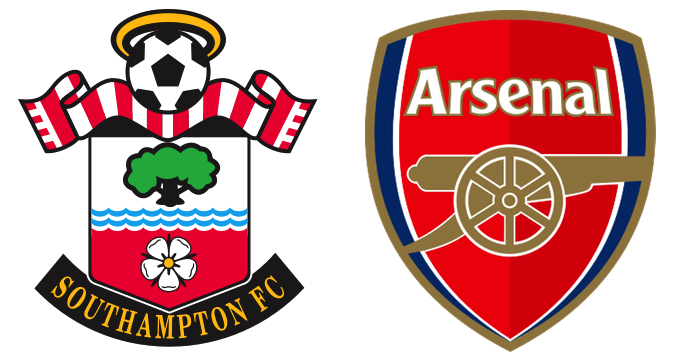 Brilliant goal – 1-0 Saints. Saints began to dominate and both Ward Prowse (twice) and Davis had chances to extend the lead but their shots missed the target. Long continued to harry the defenders – on 34 minutes he took the ball off Mertesacker and back-heeled it through Cech’s legs but the referee had blown for a foul on the German. Long was booked for persistent fouling of Arsenal defenders. He was certainly giving them a torrid evening. On 37 Arsenal at last created a chance, Ramsey setting up Walcott, but his shot was saved. Then Fonte was obliged to give away a corner. Ozil’s cross was met by Theo whose header flew wide of the post. As the first half drew to a close, Long had a great chance to extend Saints’ lead. Mané sent him scurrying beyond the Arsenal defence but, in trying to lift the ball over Cech’s dive, the Irishman put the ball high over the bar. Saints continued to hunt a second but when half-time arrived it remained 1-0. Early in the second half Saints did get the ball in the net. Koscielny’s foul on Mané gave JWP the chance to swing the ball over. A number of Saints players may have been offside but Virgil didn’t seem to be one of them. But, as his looping header dropped into Cech’s goal, the linesman’s flag saved Arsenal. Saints did get a second on 54 minutes. Winning the ball deep in their half, Davis played a ball up to Long. In front of Koscielny, he tapped the ball right to Mané. As Koscielny turned to get back, Long dumped him on the ground and drove towards the back post. Mané duly returned the ball for a tap in. 2-0. The smile on Long’s face said much. Saints sat on their lead for a while inviting Arsenal forward. Ozil set up Ramsey but his shot was fielded by Stekelenburg. On 63 Oxo came on for Campbell and a couple of minutes later Clasie was hurt and Romeu replaced him. Oxo was caught offside. Saints played a long ball forward which Koscielny, under pressure from Long, put out for a corner. Bertie curled his cross towards the near post where Fonte eluded the “zoned out” defenders to head home - 69 minutes gone and 3-0 up. Saints replaced JWP with Tadić and Arsenal sent on Chambers for Flamini. Tadić was soon in the action, drawing a save from Cech with a curled shot from distance. Further then saw Iwobi on for Theo and Jaunmi for Mané. Long continued to pester Arsenal and, despite further offsides, he got clear on 88 minutes and his cross-shot bounced away from the far post. This set in train another flurry of Saints pressure. First Tadić set up Romeu whose shot was blocked. Then Romeu set up Jaunmi who also saw his effort charged down. In injury time the dam finally broke. Tadić sent Long free behind the defenders and he tucked his shot under Cech. 4-0. Merry Xmas indeed! There was time for another Saints corner and for another Saints shot – by Tadić – to be charged down - but time was up. The Saints had marched on – to much rejoicing.